New e-resources being trialled this Term! 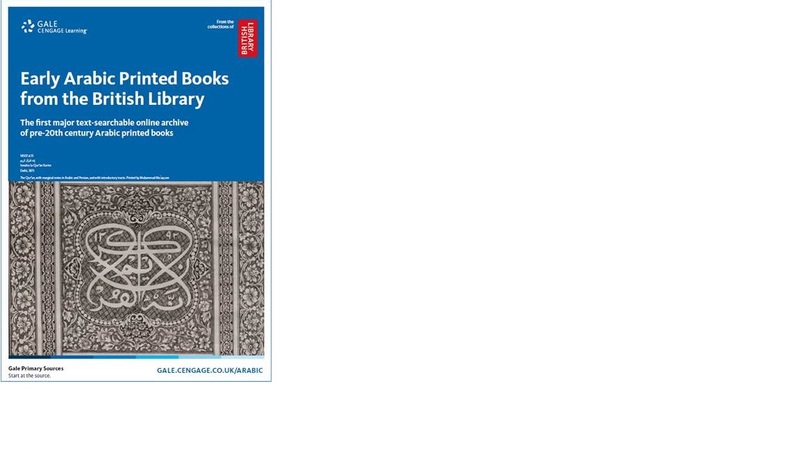 Gales Early Arabic Printed Books from the British Library, based on A.G. Ellis catalogue of the British Librarys collection, represents the first major searchable online archive of pre-20th century Arabic printed books. It includes examples from over 400 years of books printed in Arabic script as well as translations into European and Asian languages in the fields of Islamic religion, history, law, language, literature, philosophy and science. Together they demonstrate Europes fascination, study and assimilation of ideas and knowledge from the Arabic-speaking world with its rich heritage of science, poetry and Islamic texts and commentaries. Scholars can search on the full text of items in Arabic, English, French, German, Latin, Italian, Dutch and Spanish while also being able to discover content in Greek, Hebrew, Hindi, Ottoman Turkish, Persian, Syriac and more. Serving the countries and territories of the Arabic League and beyond, this Middle Eastern collection of more than 4,000 Arabic e-books covers a broad range of academic subjects, including art, biography, business, child development, education, medicine, social sciences, humanities, Islamic studies, history, law, music, religion, political science, technology, engineering and more. This unique full-text database is ideal for students and researchers of Arabic Studies, Middle Eastern Studies and Islamic Studies. Covering many major subject disciplines, it offers academic journals, magazines, trade publications, conference papers and industry profiles that are published in or pertain specifically to the Arab World. This entry was posted in Uncategorized on 8 February 2017 by katieguest.